NEW YORK - Rookie star Aaron Judge belted a two-run homer as the New York Yankees overcame a rocky start to win their American League wild card playoff with the Minnesota Twins 8-4 on Tuesday. Judge smashed his 53rd homer of the season in the bottom of the fourth inning to help the Yankees into a 7-4 lead, setting up a victory which advances them to a place in the best-of-five division series against the Cleveland Indians starting on Thursday. It was another blockbuster effort from the 25-year-old Californian, who has lit up the Yankees season with a record-breaking year with the bat. 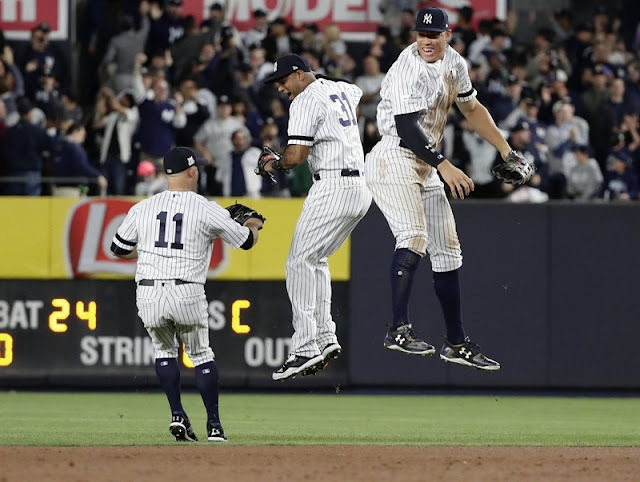 Judge's 386-foot home run followed a wild start to the game which saw the Twins power into a 3-0 lead in a dramatic first inning at Yankee Stadium. Brian Dozier set the tone with a monstrous lead-off home run to give the Twins a 1-0 lead, bludgeoning a fly ball to left center field for the score. Eddie Rosario then homered with a line drive to right field which allowed Jorge Polanco to get home and put the Twins 3-0 up. Yet just when it looked as if the Twins early blast might prove decisive, the Yankees came roaring back in the bottom of the first. With Brett Gardner and Judge on base, shortstop Didi Grigorious smacked a home run to level the score at 3-3. A Gardner home run into right field in the bottom of the second put the Yankees 4-3 up but Minnesota did not have long to wait to get back on level terms. A Byron Buxton ground ball allowed Jorge Polanco to score and level at 4-4. The Yankees then edged ahead in the bottom of the third when Greg Bird singled to allow Gary Sanchez to get home and put the Yankees 5-4 ahead. It was then left to Judge to belt his two-run homer to give the Yankees a three-point cushion. Aaron Hicks was then walked by Alan Busenitz with the bases loaded to allow Judge to score and extend the Yankees lead to four runs. Rookie star Aaron Judge belted a two-run homer as the New York Yankees overcame a rocky start to win their American League wild card playoff with the Minnesota Twins 8-4 on Tuesday.